This product binds to the extracellular domain of human ErbB2. A head-to-tail dimer through its peptide bond. Affibody® affinity ligands are unique research reagents, produced using innovative protein-engineering technologies. They are small, simple proteins composed of a three-helix bundle based on the scaffold of one of the IgG-binding domains of Protein A. Protein A is a surface protein from the bacterium Staphylococcus aureus. This scaffold has excellent features as an affinity ligand and can be designed to bind with high affinity to any given target protein. The domain consists of 58 amino acids, 13 of which are randomized to generate Affibody® libraries with a large number of ligand variants. Thus, the libraries consist of a multitude of protein ligands with an identical backbone and variable surface-binding properties. In function, Affibody® Molecules mimic monoclonal antibodies. Compared to antibodies, the most striking dissimilarity of Affibody® Molecules is the small size. Affibody® Molecules have a molecular weight of 6kDa, compared to the molecular weight of antibodies, which is 150kDa. In spite of it's small size, the binding site of Affibody® Molecules is similar to that of an antibody. The advantages of Affibody® Molcules over antibodies are: -their small size -the simple structure of the molecules -its robust physical properties; able to withstand a broad range of analytical conditions, including extreme pH and elevated temperature -its ability to fold correctly intracellularly -the fast and cost effective production in bacteria -the potential to couple Affibody® Molecules in multimeric constructs Affibody® Molecules have highly competitive properties for applications within affinity purification, sample preparation, protein detection and in vitro diagnostics. ab50345 is a secondary antibody suitable for use in the process of detecting this Affibody® Molecule. This Anti-ErbB2 Affibody® Molecule is modified with a unique C-terminal cysteine for directed single-point chemical modification, facilitating labelling with fluorescent dyes, biotin or coupling to matrices. However, tail-to-tail dimers are spontaneously generated via a disulphide bridge between the C-terminal cysteines. Prior to coupling via the C-terminal the Affibody® Molecule needs to be reduced to expose the reactive cysteine residue. Recommended reducing condition is 20mM DTT at a pH above 7.5 and incubation at room temperature for 2 hours. Remove excess DTT by passage through a desalting column, not by dialysis. The purity of this product is >98% as determined by SDS-PAGE (Coomassie blue staining) and RP-PLC analysis. Our Abpromise guarantee covers the use of ab31889 in the following tested applications. 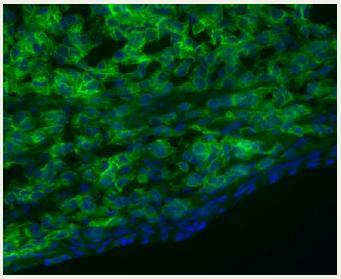 The human mammary gland cell line SK-BR3 expresses high levels of ErbB2 and this cell line was used to demonstrate Affibody® fluorescence staining and to compare three different staining reagents for cells. Fluorescein conjugated (a), biotin conjugated (b) and Oregon Green® (c) labeled Affibody® molecule were used as reagents in this experiment. The SK-BR3 cells were stained for 30 minutes at a concentration of 1-5 μg Affibody® molecule/ml. Figure 1 a-c shows bright membrane staining with all three reagents. As both the fluorescein conjugated and Oregon Green® labeled Affibody® molecule function as one step reagents, the staining procedure was completed in only 30 minutes. Nuclei were counter stained with DAPI (blue fluorescence). Frozen tissue sections were obtained from snap frozen xenograft SK-OV-3 tumors. The sections were stained with Oregon Green® conjugated Anti-ErbB2 Affibody® molecule for 30 minutes at a concentration of 2 μg Affibody® molecule/ml. The resulting microscope image shows brightly stained SK-OV-3 cells inside the tumor whereas the connective tissue surrounding and traversing the tumor cells remained negative. Xenograft tumors of the human ovarian adenocarcinoma, SK-OV-3 was soaked in formaldehyde and then snap-frozen in liquid nitrogen and used for immunohistochemical staining with the HRP-conjugated Anti- ErbB2 Affibody® molecule. Frozen tissue sections were stained with HRP-conjugated Anti-ErbB2 Affibody® molecule for 45 minutes at room temperature. The staining was developed with DAB substrate and the tissue sections were counter stained with Mayers Haematoxylin. 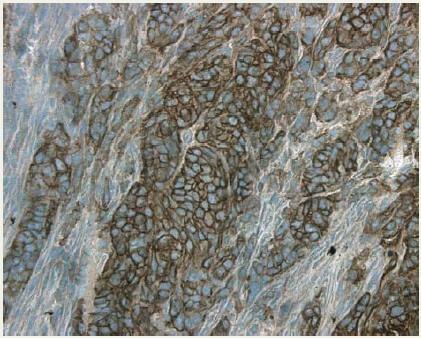 The resulting microscope image shows strong brown membrane staining of tumor cells in the xenograft whereas the mouse connective tissue that surrounds and traverses the tumor remains negative. Thus, the HRP-conjugated Anti-ErbB2 Affibody® molecule is a rapid reagent for ErbB2 specific immunohistochemical staining of frozen tissue sections. The Oregon Green®-conjugated Anti-ErbB2 Affibody® molecule was used as a one step detection reagent for analysis of ErbB2 expression using flow cytometry. Cells from the ErbB2 positive human ovarian cancer cell line SK-OV-3 and the ErbB2-negative human neuroblastoma cell line SH-SY5Y were stained with the Oregon Green®-conjugated Anti-ErbB2 Affibody® molecule. As shown in figure a, staining with Oregon Green®- conjugated Anti-ErbB2 Affibody® molecule resulted in increased fluorescence intensity and the whole cell population of SK-OV-3 cells was shifted to the right (red line) compared to the control (black line). On the contrary, Anti-ErbB2 Affibody® molecule staining of the ErbB2 negative cell line SH-SY5Y did not cause a shift in fluorescence intensity, as shown in figure b. Publishing research using ab31889? Please let us know so that we can cite the reference in this datasheet. I got a positive Flow Cytometory result by ab31889, Anti-ErbB2 Affibody® Molecule, with cells derived from mouse. Does ab31889 have cross reactivity with mouse ErbB2, or should it be considered false-positive result? Thank you for your enquiry. We have never looked for binding between ab31889 and mouse recombinant HER2/ErbB2. We do know from biodistribution studies that it does not bind to normal mouse tissues. However, HER2 is normally expressed at a low level or not at all and the ab31889 has not been tested on high HER2 expressing mouse cells. Mouse and human ErbB2 are quite homologous (87% acc. to Swissprot). So there is good chance for ab31889 to cross-react with mouse ErbB2. I hope this information helps you, and please do not hesitate to contact us if you have further questions. Do you have any affinity data between your affibody and ErbB2 receptor? e.g. Kd (Dissociation constant) or IC50 etc. Thank you for your inquiry. The affinity of the monomeric Anti-HER2 Affibody® Molecule (not this product) has been measured, with a Kd value of 32 pM (picomolar). However, ab31889 is a head-to-tail dimer which has an even higher affinity to HER2 due to avidity effects. This higher affinity has not been quantified. I hope this information is helpful to you. Please do not hesitate to contact us if you need any more advice or information. I would like to know the sequence and pI of this product ab31889. Thanks! Thank you for your enquiry. The amino acid sequence for the Anti-HER2 Affibody® Molecule ab31889 can be found in the article by Orlova et al. (2006) "Tumor Imaging Using a Picomolar Affinity HER2 Binding Affibody Molecule" Cancer Res 2006; 66(8): 4339-48. It is denoted in this article as HER2:477 (figure 1.c) and the sequence of the recognition site is MRNYWALVAKRRY. The theoretical pI of the Anti-HER2 Affibody® Molecule is 9.7. I hope this information helps. Please do not hesitate to contact us if you need any more advice or information. I am running positive controls using the anti ErbB2 affibody molecule (ab31889) conjugated with a dye. I wanted to know what the appropriate IgG isotype I should use to show that there is no nonspecific binding in a her2 positive cell line. I'll do the same with negative controls but I am just not sure what isotype to use for the IgG. Your help would be greatly appreciated. Thank you for your enquiry. The ab31889 Anti-ErbB2 Affibody® is not an antibody, but an 'Affibody'. The backbone of Affibody® molecules are derived from a 58 amino acid IgG-binding domain of Staphylococcal Protein A. There is further information on 'Affibodies' on the datasheet for this product. An IgG isotype control works only with antibodies and is not applicable for Affibody® Molecules. For additional information about our fluorescence staining of a HER2-positive cell line using our Anti-HER2 Affibody® Molecule, see the article by Orlova et al. (2006) "Tumor Imaging Using a Picomolar Affinity HER2 Binding Affibody Molecule" Cancer Res 2006; 66(8): 4339-48. I hope this will be helpful to you. Should you have any further questions, please do not hesitate to contact us again.